44 / the tasting panel / december 2015 HOT PROPERTY N ightclub impresario Andy Masi and Chef Luciano Sautto celebrated the grand open- ing of Salute Trattoria, a concept dedicated to their shared passion for Southern Italian cuisine. The trattoria makes its home inside the Red Rock Casino Resort, a desert oasis off the Las Vegas Strip in Summerlin, NV. Masi is a New York–born, Las Vegas nightlife mogul while Chef Sautto's family owns the legendary Pizzeria da Michele in Naples, Italy. Although Masi and Sautto have very different backgrounds, they share a deep love for all things Amalfi. "We toured up and down the Amalfi Coast of Italy trying different dishes," Masi says. "We traveled together. We laughed together. We ate a lot of food and drank a lot of wine. Then, the dishes we loved, Luciano would figure out how to recreate them back in Vegas and put his own touches on them." Salute Trattoria isn't Masi and Sautto's first pairing. They also created the celebrity hot spot Joi and the Bianca Restaurant at the iconic Delano South Beach hotel in Miami. Salute is however, their first effort under the moniker Clique Hospitality, which Masi cre- ated after selling his wildly successful nightlife entertainment company The Light Group, which he co-founded in 2001. Together with Red Rock Casino owner Frank Fertitta, Masi and Sautto have created a tribute to the food as well as the beauty of Amalfi. Salute Trattoria is an ornate spectacle of Amalfi-influenced design. The restaurant features an open kitchen with a brick pizza oven wrapped in a mosaic of Italian tile and marble, a 4,000-square-foot dining room with exposed wood on the ceiling, travertine and wood flooring and beveled glass doors that open onto a stunning patio. There's also an extravagant antipasto bar where Italian meats, cheeses and an array of fresh seafood are displayed, and a gelato bar pressing fresh Amaretti waffle cones. "The design was very important to us," Masi says. "Especially the kitchen. You see open kitchens all over the place, but you seldom see a really pretty one. 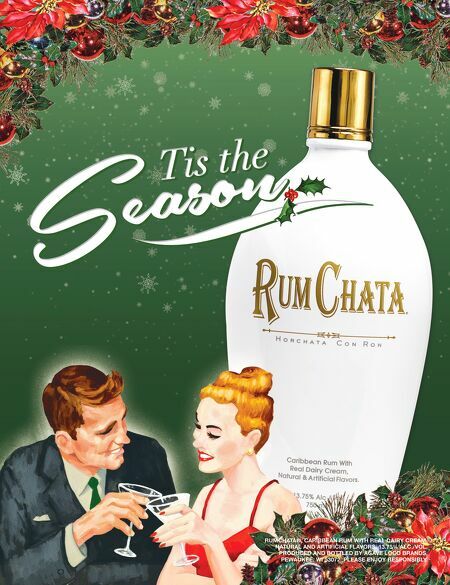 When you look in our kitchen, it's beautiful. Even the back walls are covered in tile and marble. The stainless steel is so super polished. Every little detail just pops." Red Rock may be in the desert, but Luciano insists he's not wanting for product or ingredients. "I'm not having any issues getting anything I want. I have tomatoes and aru- gula growing in Arizona. I'm using vendors from L.A. I have providers from Italy," Sautto insists. And whatever he can't get, he makes. "I make my own pasta, my own mozzarella, my own gelato and I make the cones," he adds. The menu features traditional antipasto selections such as prosciutto and melon, crudo selections of hamachi, albacore and salmon. Featured pasta dishes included gnocchi with San Marzano tomatoes, truffle tagliatelle and tableside fettuccini with vodka sauce. Among main courses, whole roasted and salted branzino is a house specialty. But what is going to bring diners off the strip to Red Rock Casino? Chef Sautto knows the answer: "If you want a real Southern Italian experience created by guys who love Italy, who understand the culture and the tradition, Salute is the only true thing you're gonna find in Las Vegas." Salute! 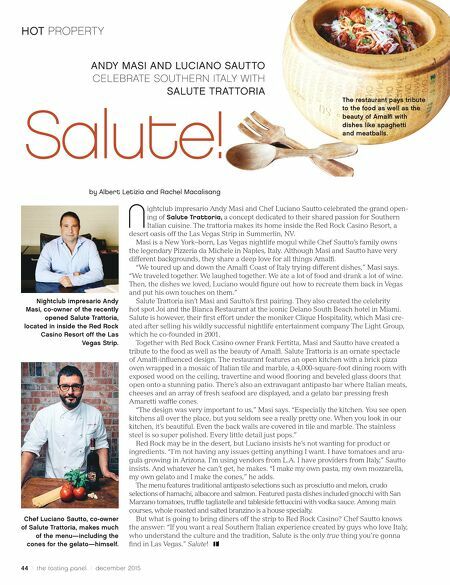 ANDY MASI AND LUCIANO SAUTTO CELEBRATE SOUTHERN ITALY WITH SALUTE TRATTORIA Salute! by Albert Letizia and Rachel Macalisang Nightclub impresario Andy Masi, co-owner of the recently opened Salute Trattoria, located in inside the Red Rock Casino Resort off the Las Vegas Strip. Chef Luciano Sautto, co-owner of Salute Trattoria, makes much of the menu—including the cones for the gelato—himself. The restaurant pays tribute to the food as well as the beauty of Amalfi with dishes like spaghetti and meatballs.